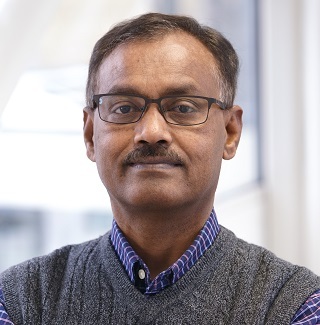 Asoke K. Mal, PhD, joined the faculty of Roswell Park Comprehensive Cancer Center in 2008 as an Assistant Professor of Oncology in the Department of Cell Stress Biology. Dr. Mal came to Roswell Park from the Lerner Research Institute, Cleveland Clinic Foundation, OH, where he was on the faculty of the Department of Molecular Genetics. He earned his doctoral degree in 1993 in Biochemistry from the University of Calcutta, India. Dr. Mal is a member of the American Association of Cancer Research and the American Association for the Advancement of Science. He has authored or co-authored several journal publications. Dr. Mal’s laboratory focuses on rhabdomyosarcoma (RMS), a family of highly aggressive myogenic soft tissue cancers usually occurring in children and adolescents. Despite intensive traditional multimodal therapy, outcomes for high risk patients with RMS have not significantly improved, and survival of metastatic or relapsed disease remains extremely poor. Specific goals of his research program include the identification of signaling and epigenetic vulnerabilities in RMS and understanding associated molecular mechanisms in order to derive novel therapeutic targets for treatments for these patients. His laboratory uses multidisciplinary approaches involving cell cultures and animal models to study the biological consequence of these events in RMS tumor malignant behaviors. His efforts also involve a drug-discovery approach, where he leverages current understanding of RMS to screen for and identify novel compounds which could be exploited as potential agents in therapeutic intervention for this cancer.